Another week, another 2tn of JPY buying … mostly due to the Japanese selling foreign assets. Over the last four weeks, the net-net total flow sums to Y3.8tn, which has been split about evenly between Bond flows and Equity flows. In the last week, this changed a bit, with net equity flows about flat. 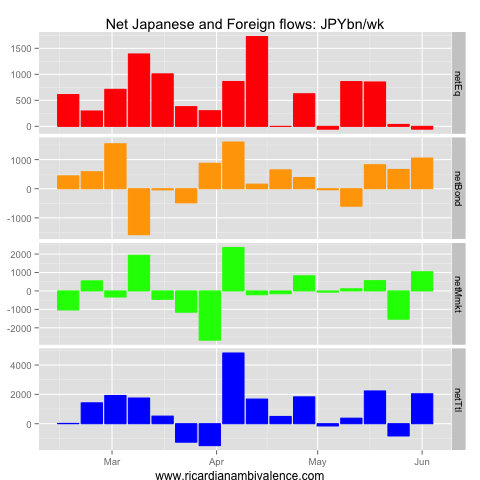 Instead, the net-net inflows were fairly evenly split between Bonds (due to Japanese selling foreign bonds) and money market (foreign buying Japanese money market). The dominant trend continues to be the Japanese taking profits on their foreign asset portfolio: net sales of bonds and equities summed to Y1.3tn in the week to 1 June. 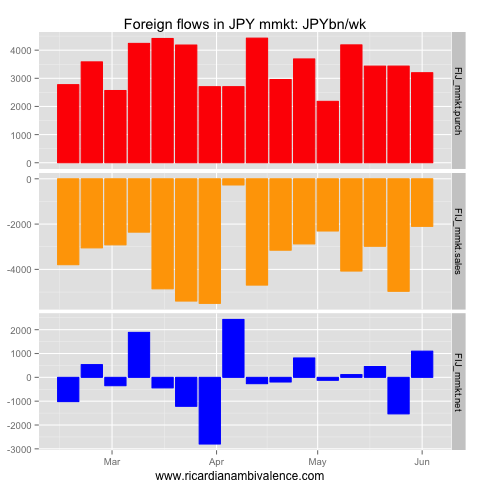 There was slightly better buying of foreign money market paper, which reduced the total inflow to around Y1.25tn. 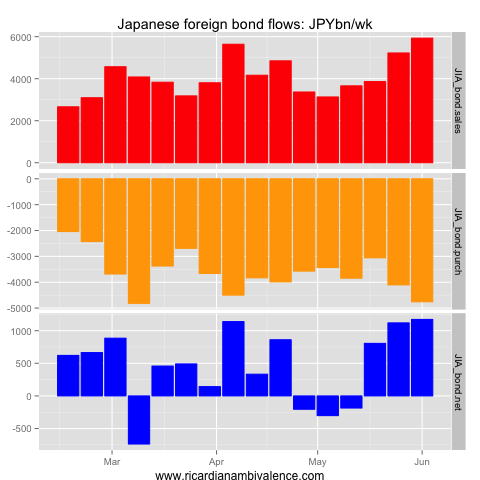 In the foreign bond space, the Japanese are very active, with Y5.9tn of sales in the month and Y4.8tn of purchases. 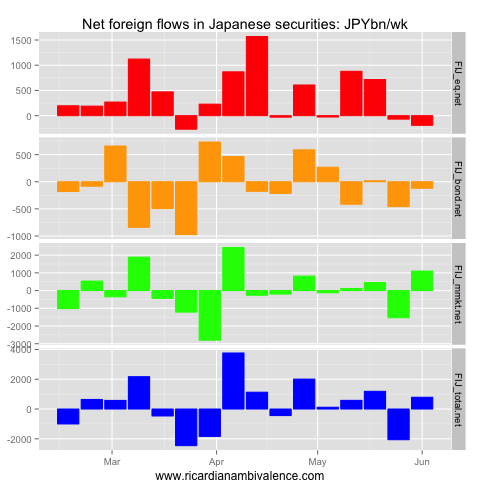 Netting, the Japanese sold around Y1.2tn of foreign bonds in the week to 1 June. 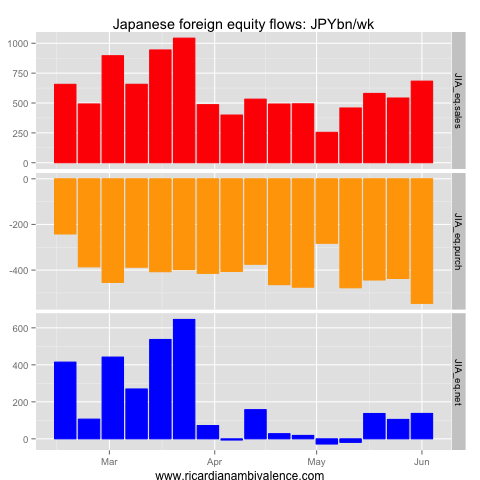 The equity flows are also JPY supportive, with Y140bn of foreign equites net sold in the week to 1 June (Y683bn of sales and Y546bn of purchases). Net money market flows have been outward, with Y120bn of sales offset by Y220bn of purchases. 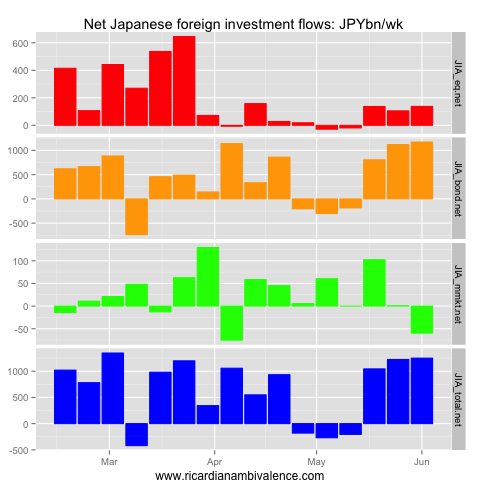 Foreign investors in Japan are getting out: in the week to 1 June, foreign investors sold Y310bn of bonds and equities (down a little on the prior week’s Y530bn withdrawal). 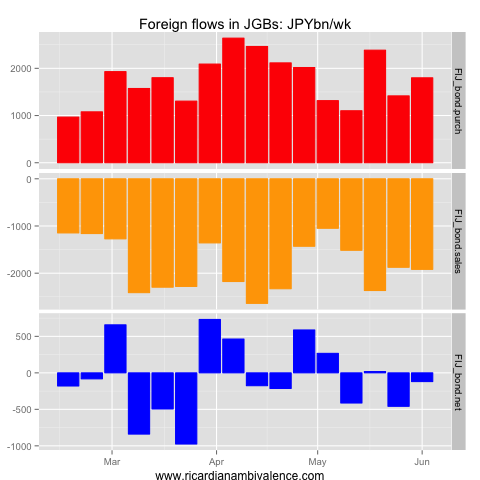 Money market flows are offsetting (but probably FX hedged, so not offsetting for the JPY), with a Y1.1tn net-inflow for the week swinging the total to an inflow of Y790bn. In the JGB market, activity on both sides is picking up, however the market remains better offered by the foreign sector. Foreign purchases were Y1.8tn in the week to 1 June, whereas sales were Y1.9tn, leading to a net outflow of Y120bn in the week. 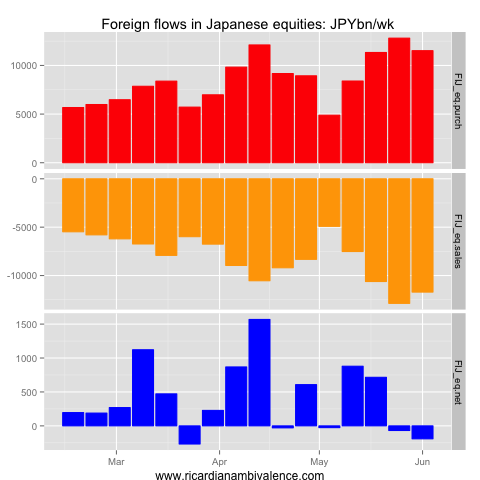 As ever, foreign flows in Japanese equities were much larger. Equity purchases were Y11.5tn and sales Y11.7tn, taking the net flow to Y190bn for the week. 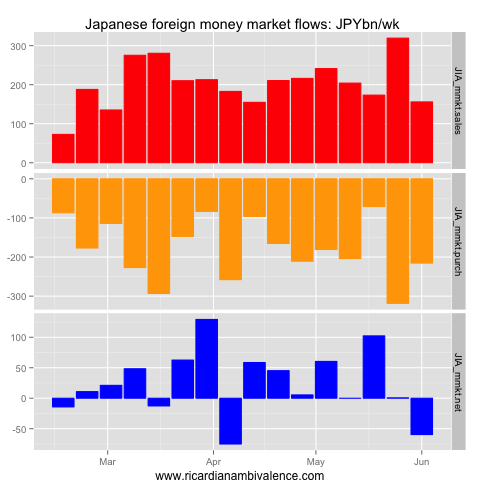 Finally, in the week just gone, foreigners purchased Y3.2tn of Japanese money market paper, which dwarfed their sales of Y2.1tn, leading to an inflow of Y1.1tn. This is likely to all be FX hedged, so i think it unlikely to have an import for the JPY. This entry was posted in BoJ, JPY and tagged Flows. Bookmark the permalink. you are still the author with the most articles. Only you and David Glasner on Japan. Great pairing if you ask me! Thanks. Your support encourages me to keep it up!